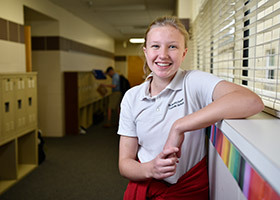 ARLINGTON — When looking for someone to volunteer for nearly anything at St. Maria Goretti Catholic School in Arlington, staff and faculty know they will always see the smiling face of Ashlynn Wessel. 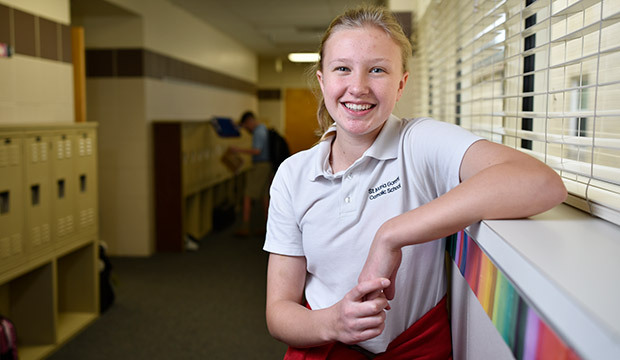 Religion teacher Taylor Jordan, who nominated the 13-year-old eighth-grader as the school’s representative for Catholic Schools Week, said Ashlynn is a delight to work with and be around. St. Maria Goretti Parish is home to more than 1,500 families and celebrated 75 years in 2016. The Sisters of St. Mary of Namur founded their school in 1954 and provided all the principals and many of its teachers for the school’s first 36 years. Today, the school located in north Arlington has 280 students in grades pre-K through eighth and a staff of 40, including 30 teachers. Ashlynn, the daughter of Stewart, a principal of Aspire Legal Search Group, and Michelle, who works in the Nolan Catholic High School business office, shares her home with a sister, Delaney, a sophomore at Nolan, and her nine-year-old dog, Sophie, rescued from an area shelter. Behee and Jordan said her contributions extend to Mass, where she is an altar server, a sacristan, and a hospitality minister. Ashlynn also participates in basketball, soccer, softball, track, and volleyball. A member of the National Junior Honor Society, her favorite subject is science and she is considering a career in law enforcement — again with a mindset of helping others. Ashlynn said her faith is paramount.